The Chart of the Day belongs to National Storage Affiliates (NSA). 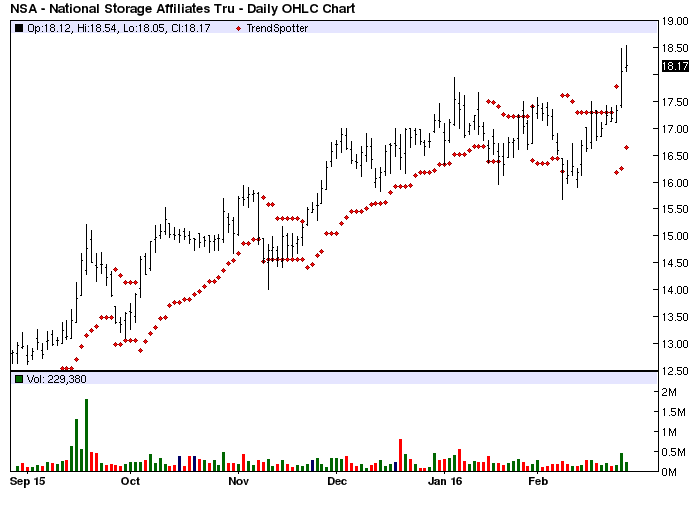 I found the self storage unit REIT by using Barchart to sort today's All Time High list first by technical buy signals, then I used the Flipchart feature to review the charts. Since the Trend Spotter signaled a buy on 2/24 the stock gained 4.91%. Although the Price vs, the 100 Day moving average as been a reliable technical trading strategy on this stock you might want to consider holding it and putting it on a DRIP .